I stopped blogging. I stopped blogging. I stopped blogging. I wanted to. I just couldn’t bring myself to. I couldn’t find the words to say. I couldn’t find the time. That killed me inside. I love writing. I love expressing myself in this way. Even the television shows I used to love and blog about weren’t what I wanted to express. I was busy in the last half of 2018. I had to find myself again. I took the longest break from blogging that I have probably ever done. But that’s okay. It’s okay to focus on yourself. To stop doing things that require time and energy to be the person you want to be. May was a little heartbreaking. Hopefully June is better. This is pretty much how I start all of these blogs. The Summer is not big on premieres and cancellations (since most are cancelled in March/April/May). So here's to hoping. I generally try not to speak on topics like this online. But, I read this article and it just irritated me so badly. Let me start out by saying... I don't like beer. I've never liked beer. I want to start. 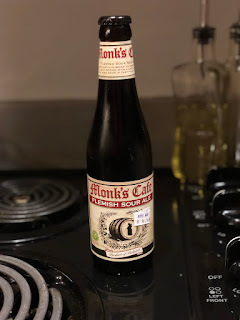 Tonight, I'm trying Monk's Cafe Flemish Sour Ale. It was suggested by a coworker. He gave me a lavish explanation and I nodded as if this made total sense. It did in theory, but (to me) beer is beer. There is varying degrees of beer from tolerable taste to absolutely disgusting. The latter ends up down the drain. Initially, the Monk's Cafe was amazing. It is in a bottle though so it didn't stay as cold as it needed to be. The first few sips were amazing, but as it became warmer, it started tasting like any other domestic beer (in my opinion). I just want to find a beer that I love 10/10.